If you are the unpaid caregiver for someone who requires in-home care — whether you’re a parent, spouse, or child of the person with special needs — there’s a good chance that you’ve already been through a lot. After all, taking care of someone with special needs can be a difficult task, especially if you don’t have formal training. Sudden changes in the condition of a loved one can be difficult to take; it’s perfectly understandable if you want external help as quickly as possible. We want that for you as well, but at the same time we are also dedicated to providing your loved one with the absolute best in home health services. 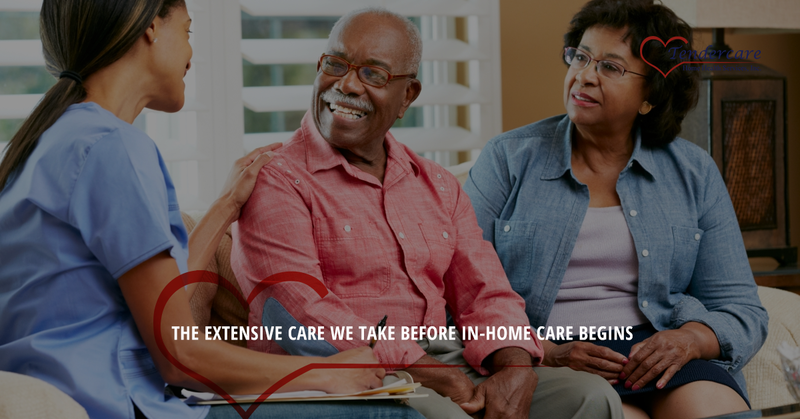 That’s why we have processes in place to make sure that every aspect of at-home healthcare is covered, ensuring that your loved one has the most fulfilling life possible. As you’ll soon see, the process might be the same, but the plan is always specific to each individual client. First of all, our nurses need to talk with you about your needs for the person currently in your care. If they’re able, we’ll also talk with the patient themselves. This will include how both you and they feel about their care, what aspects of their condition are most troubling, and what they’d like to see in the future. We’d also more than happy to talk to others in the household that might have interactions or attending to the patient. This aspect of the process can’t be overstated. We need to know where everyone stands, and what each one wants to get from it. You’ll be talking to admissions nurses who might be asking some difficult questions, but it’s important that everyone is as honest as possible. After all, a successful plan for in-home healthcare can rest on some of these early encounters with our staff. You’ll also need to talk with our administrative professionals. What insurance plans are in place to help cover the cost of in-home care? How much interaction have you had with those at Medicare? Even if you have been denied certain benefits, we might be able to help you find alternatives and negotiate the insurance process. We want you to get help for your loved one, and we hope you’ll forgive us if we’re less than humble and say that we offer the best home health services in the Indiana area! It’s imperative that your loved one’s doctor, or doctors, are involved in the process. The doctor has helped you make many decisions, and it’s important that a plan is in place so that the registered nurses at Tendercare can follow through with that specific plan. We’ll make sure all medical procedures are properly implemented so that the patient is properly taken care of every day. Some occupational therapy we offer might take a couple of hours a few times a week. Other patients will need constant 24-hour home care. That’s where the scheduling coordinator comes, making sure that the right registered nurses and therapists are at your home at the right time. While at first this extensive process might seem laborious, it’s incredibly important to ensure that the patient is getting exactly what they need. Once this process is put in place everything will go much more smoothly, allowing you to continue with a more normal schedule while ensuring that the person with special needs have the most fulfilling life possible. Tendercare has admissions nurses and case managers ready to discuss the specifics of homecare services with you. Contact us today and you’ll be that much closer to getting the perfect plan in place.